Grace Olivia Kenan Tippett passed away Sunday October 14, 2018 at her home at the age of 102. A funeral service will be 11:00 am Wednesday at George Brothers Funeral Service. Burial will follow at Guilford Memorial Park. The family will receive friends one hour prior to the service time. Grace was born on March 26, 1916 in Duplin County, N.C. She was preceded in death by her husband Fred Gale Tippett, sons James Donald Tippett, Theron Michael Tippett, and an infant son. Grace was the last survivor of the late William Alford Kenan and Lenora Jane Moore Kenan. Grace graduated from Sumner High School. She retired from Jefferson Standard Life Insurance Company (Pilot) after 28 years of service. She was an active member of American Business Women’s Association, Old North State Chapter for many years. In 1977, she was awarded Woman of The Year for her contribution to the chapter. Grace’s favorite hobbies were quilting, crocheting, and knitting. She quilted for each of her four children, ten grandchildren, and 26 great-grandchildren. One of her greatest delights was surf fishing with her grandchildren. 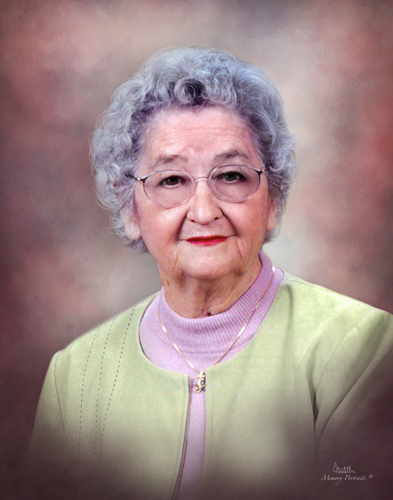 Grace was a long-time faithful member of Vickery United Methodist Church, As an active member, she taught Sunday school, and participated in many church functions. Grace is survived by two of five children; Farrell Tippett and Carolyn Tippett Baker; daughter-in-law Jeanne Tippett; ten grandchildren, twenty-six great- grandchildren, and one great-great-grandchild. Memorials may be directed to Vickery United Methodist Church, 5348 Vickery Chapel Rd. Greensboro, NC 27407, Hospice & Palliative Care of Greensboro 2500 Summit Ave. Greensboro, NC 27405, or a charity of one’s choice.